The beautiful wooden interior of the Crystals Retail Center on the Strip at CityCenter was quite spectacular, though I hope the wood holds up under all the traffic this area will see. I was there within weeks of the opening and noticed already there are some marks on this remarkable floor, which appeared to be a blend of various exotic woods. 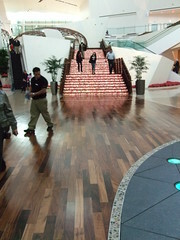 The staircase has embedded agates which are backlit to create an amazing effect - Crystals has a very beautiful decor. 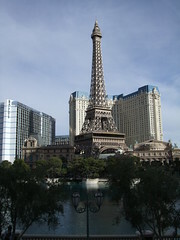 One of the prettiest views in Las Vegas is from the front of the Bellagio looking out over the Bellagio Fountains, across the strip to Paris Las Vegas' half sized Eiffel Tower. 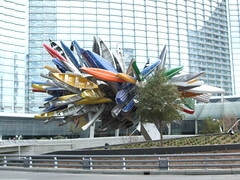 Note that the Bellagio is something of an "anchor" for a lot of fun action in the center of the Las Vegas Strip. The fountains are a "must see" and inside you'll find some of the most appealing hotel decor in the world, including an incredible art gallery (fee charged but worth it), huge chocolate fountain, and beautiful conservatory with flowers that change with the season. A tram now takes you from the Bellagio to the Crystals Shopping Area where you can access the Vdara Hotel, Aria Hotel and Casino, or keep riding to the Monte Carlo. The Casino Times has a nice feature with ten items that distinguish Las Vegas' new city within a city - CITYCENTER. This huge project was large even by Las Vegas Standards and many were concerned about a year ago that it would not be completed, but after a lawsuit against and and subsequent loan to partner in the project MGM, Dubai World and MGM did complete one of the world's greatest commercial developments.